On August 24th, 2005 we marked 10 years of effort on the 330, as well as 60 years since the Yosemite Valley Railroad ceased operations. I'm pleased to include a rare color picture in this update showing the 330 in company with RPO #107, coupled exactly as they are today. 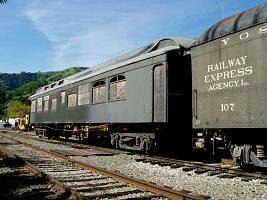 The picture was taken by Al Rose, longtime YV fan and railroad historian. Al was shooting color well before most others, and his photos are the only known color shots of the YV. Al was actively helping with arrangements for the move of the 330 in June of 1995, one of the last things he did was scrounge up original blueprints of the 330 drawn by Hicks when the car was built. Regrettably Al suddenly passed away that June, but secure in the knowledge that his favorite car was saved. His wife, Helga Rose recently visited the car at it's new location, and had lunch with us on the rear deck. She graciously allowed me to include this photo, which is also included in the new book "Trains to Yosemite", by Jack Burgess. The photo was taken at bridge 29A, 29 plus miles from Merced, and the foliage suggest it's early Spring of 1943, the time is probably about 8:00AM. This is my all time favorite photo of the 330, I can almost feel the morning chill and hear the wistful chuff as the lazy cloud of steam drifts by. This site is still accessible by car, while the bridge is gone, the concrete work still marks the location. Simply take the road to Lake McClure and keep you eyes peeled. 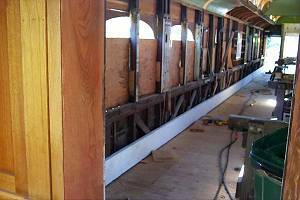 Now, as to recent progress on the 330, we received the stained glass shipment last Wednesday, and already have fit 18 of the 26 clerestory frames with glass. 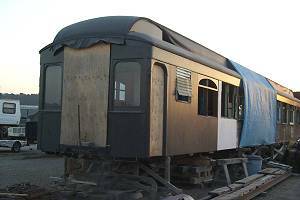 Saturday Sept 3rd and Sept 10-11th will see the car buttoned up with clerestory glass. A new volunteer has started, Linda Schultz. Her specialty is stained glass, and Wednesday we worked on glass all day. She is quite good, and carefully we diced of the sheets of glass, 3 windows to a sheet. Linda also knocked together another arched window center. At this point, my best bet is to lay off the stained glass and focus on woodwork and brakes. 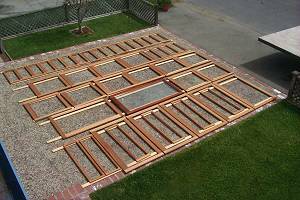 Additional volunteers have emerged, my contribution will be to keep jigs ahead of them, and work on window frames for the bathrooms, also to be stained glass. Our website has recently been updated by George Schnurle (jr), kudos to him for putting the face on our project. If you visit our website, send him an email with comments and or suggestions. I've been spending some time working on the observation platform at the end of the car. I went into sticker shock when I priced Mohogany, it jumped from $4.50 to $8.50 a board foot in the last 2 years. The rear of the car is starting to show red varnished mohogany in place of the pasty blue chipped paint, in fact parts of it look pretty good, at least enough to get the imagination rolling. The museum took delivery of the structural pieces for a new large building, and in fact plan to start construction this fall. Apparently the building will house the delicate wood cars, including the 330. We may be in the building this year. More on this in future updates. Sid Gilbrech brought over a step template for approval. When we removed the old and much modified steps, Sid took on the project of creating a standard step profile. He was the perfect choice to lead this part of the project, as it requires careful measurement, historical research and not a little bit of interpolation. I was most pleased with the profile he selected. Steps are being constructed at his house. Dave Lion has been checking out the wiring and labeling it in the car, as well as researching how we will work in train, separately, etc. Also he's working on plans for the sound system. Now with all that help, you would thing the beam would be history. Well, it's ALMOST history. Yesterday we finished the last detail work prior to installation. Those diagonal knee braces directly behind the beam needed to be finished. The bottom of each wedges up tightly against the wall stud, while a tierod with a flat "L" top grabs the top and snugs it against the next wall stud. 4 of these with special requirements were finished yesterday, as well as the vertical holes and relief cutouts for the long bolts that run from the top of the truss plank to the bottom, and through the floor and side sill directly out the bottom of the car. Alignment of these holes is both difficult and critical, as this beam adds considerable strength and stiffness to the car. I'm hoping to squeeze a day in next weekend to finish the job. On other fronts, Dave has checked our wiring and labeled everything in preparation for setting up lighting and proper outlets in the car. At some point in the near future we will be able to setup shop outlets, and as fall progresses cut in excellent fluorescent lighting to allow work to continue unabated over winter. My sister Marilyn, and her SO Randy made a contribution, greatly appreciated, and combined with Pat Cassell's previous donation we have glass on the way from Kokomo to finish the clerestory and stained glass windows. Since we have a regularly scheduled work weekend (2nd full weekend each month), updates will normally appear after that weekend, unless there are special circumstances. Peering from the first class section of the 330 is Dave Lions, who has become a mainstay of not only our project, but the museum loco, signal, track and soon operating divisions. You will note that we have organized the 330 so we have enough space to restart restoration, kudos to my trooper wife Claudia! further back you can see the YV107 tightly coupled to our car. 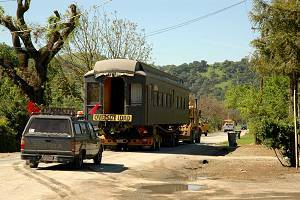 The 107 was organized at the same time, so with one more load to pick up from Roaring Camp, we have finally finished the move. Did I say we were going to restart the restoration? Well we did it with a vengeance, as you will note the messy floor to the right, and the long truss planks (TP) up on the sawhorses. We were able to mill the first TP, although there is a series of holes left to finish, and also worked on making a template for the 2 joints that will be needed to join the other 3 TPs (2 per side). The truss planks lay up on edge along the bottom of the wall, and are bolted all the way through to the bottom of the car, connecting to the side sills, and greatly stiffening the body. This also represents the closing chapter on heavy beamwork on the car, all work going forward will be non-structural pretty work. While this was going on Joe Mann, an expert blacksmith, made a keeper piece for the left front truss rod, and will be heat bending it on sometime this month. This piece was inexplicably missing, and was most likely broken off in Yreka by the previous owners. The steps are being worked on by Sid Gilbrech, he recently came and picked up enough parts to begin reconstruction off site on these increasingly needed items. Concurrent with that, Larry Rossi has taken on installing the nearly completed step hatches, starting at the rear of the car. This will increase the area available for the exotic and sweaty lunches we enjoy on the rear platform. All in all, good progress is being made, and I may have located a better and more complete brake system for the car. More on that next month! Charles Navarra was kind enough to share a picture of our first ride, enclosed in this update. Sid Gilbrech picked up the remains of the old car steps and took measurements to begin off site construction of new steps. Dave Lion spent Saturday morning needle gunning and painting journal boxes on the trucks. Larry Rossi spent Sunday starting the trap door installation. Claudia Swift spent Sunday finishing more needle gunning and painting on the trucks. I spent both days repacking journals, and helping out on the remainder of the projects under way. Indeed, the old girl got to stretch her legs today, along with the YV Railway Post Office #107 and Santa Fe Passenger car #1861 (owned by Dennis Mann). We needed to test all the journals which I finished repacking today, as well as the height on the side bearings and trucks. Before putting the train together we had to couple the 330 to #107 three times before the balky coupler would finally close for the first time in 50 years. Even after about 12 couples, it only reluctantly operated, it's still a stiff knuckle. So when was the last time a bona fide YV passenger train operated? My best guess would be August 20th, 1945, 4 days before the railroad was abandoned. On that day the Bagby bridge burned, preventing any through service on the 78 mile railroad for the remainder of it's natural life. We moved down about 1/4 mile and posed the train on a small bridge. 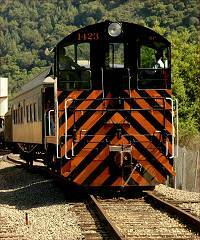 The train consist in order was SP Engine #1423, YV#330, YV#107, ATSF #1861. After parking with the 330 on the bridge we hiked down to the road, and what a sight! One thing is for certain, we have the cleanest floor of any railcar in the world when viewed from underneath, it literally shines. Alas I didn't bring my camera, but as soon as some artwork materializes (others brighter than I), I'll send it along. Yes indeed, we will be putting in a full weekend next week. Yesterday I put in a solo day, and finished almost everything underneath the car. There is less than 1/2 hour of bolting left to be done (I didn't have 4 bolts the right size). We also now have a working hand brake. We spent another weekend in the trenches getting the 330 rail worthy. Dennis Mann, whom we've met earlier in updates, was kind enough to donate eight 9" journal pads and instruct me in how to repack a journal box. 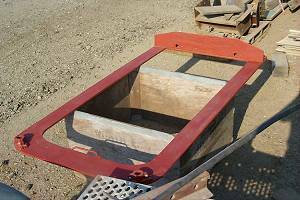 A journal box is and enclosure around where the axle meets the truck side frame. The box protects this sensitive area from the weather, and also provides a pool of thick oil to lubricate the friction bearing. All modern trucks work on roller bearings, but remember we're restoring an antique! The journal pads resemble an articulated mop, and have some form to allow them to sit in the pool of oil and wick it up to the bottom of the axle as it rotates. the bottom 2/3rds of the axle are open and the pad presses against this exposed surface. The top 1/3rd of the axle contacts the brass, actually a hybrid piece of brass and a lead alloy which rides directly on the axle to transfer the weight of the car. Ideally the oil acts as the bearing surface, but in those cases where the oil runs dry, or something foreign gets in the box, you can have a "hot box". In severe cases the box can actually catch fire. Back to the story, I don't think anyone has truly lived until they take their gloves off and plunge their hands into a black oily box and tried to wrestle a stubborn pad out from under an axle. In fact it was such a great experience I feel compelled to save the other 7 for eager volunteers! The main thrust of our work over the weekend was to get the car off the side bearings and onto the center bearings of the truck, as well as reduce the height to conform to coupler standards. As you recall from last week, this had already been accomplished on the front end, now it was time for the back end. Dave Lion showed up for another weekend of punishment, and he and I set upon the task with a vengeance. By late Sunday, we were running a bit off schedule to finish the task, when Joe Mann (yes they're brothers) showed up and put us over the top. By sunset, the car was trimmed to height, with some minor catch-up to do on our next work day. Now you know what 'you da Mann' is about. The progress has been swift, in the literal sense, after arrival at Niles. One of the things that needs to get done short term is setting the car on it's trucks correctly. For those not familiar with railroad jargon, a truck is the wheel set assembly, shown being rolled underneath the suspended 330 by Niles volunteers and yours truly. The black center pin is just to the right of Dennis Mann in the overalls. Normally the weight of the car rests entirely on the cup surrounding the pin, the pin is merely there to keep things from slipping out. There are two other surfaces on each truck that can take weight, these are called side bearings. Literally there is a bar that contacts the side bearing, grease is applied and the car can briefly contact that point when it tips from side to side going down the tracks. generally there is about a quarter inch gap during normal operations. The side bearing is the rusty shoe next to the man with the orange vest. When we set the car down on the trucks, the center plate did not make contact, and all of the weight was on the side bearings. We were able to take a slow ride into the yard in this condition, but clearly before the car is moved again we need to fine tune the fit. The other thing necessary while dialing in the trucks is to set coupler height. On moving day we were 3" high on the front end of the car, and 1" high on the back end where the locomotive coupled in. Over the weekend we had our crack volunteer crew out in force, although Dave Lion was conscripted to work on the radio on the steam locomotive (Dave is having a good time at the museum!). Gary Guttebo, who has been working on things like this his whole life ran the show, and we proceeded to jack the car up and take out the wood shims underneath the center castings and side bearings. As it works out, we needed no shims on either side bearing, and a 1" shim on the center bearing. The car will ride well at that setting, but the coupler height was still about 1.5" too high. After a copious amount of head scratching, it was noticed that the pedestals showed virtually no compression. Referring to the picture, the pedestal is where the axle meets the side frame, one of the pedestals is the very rusty spot to the right of Dennis' overalls. The pedestal can slide up and down in the side frame, buffered by two springs. The problem with our trucks is that they are tuned for a much heavier car. Our car body with couplers weighs in at a measly 50,000 pounds, about half the intended weight. The springs that control the compression are mounted between the lower and upper side frames, and literally sit between two cups. These are visible to either side of Dennis. One spring sits inside the other, so the simple solution was to remove the inner spring. Sure enough, when we were done the car was about 30% in compression, and our coupler height was about 3/8ths inch over, close enough for government work, and likely to be dead on when the car is finished and has passengers. We had intended to do both trucks on Saturday, and beam work on Sunday, our learning curve prevented that, but we did get the front truck set, and will work on the rear next Saturday. Larry Rossi also came and lent a hand, and is going to take over a few tasks next weekend as well. I can't help but open with another moving day picture of our first train ride. The old girl looks pretty good, better than I'll look when I'm 98. I didn't shoot any pictures that day, so I want to give credit to several people who have unstintingly provided the pics for these updates. Linda Walton provides todays pic. Previous contributors have been Larry Rossi, Sid Gilbrech and Dave Lion. Note the baggage/railway post office #107 in the background, about to reunite with a long lost companion. Let's see, the last time the two cars were together man hadn't broken the sound barrier, TV was about to be invented, nobody wondered if Elvis was still alive, and ah yes, people actually drove cars without cell phones glued to their heads. We are working this weekend both days, we'll be there no later than 9:00. 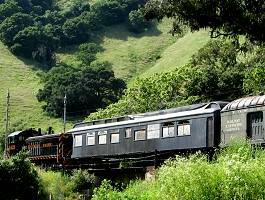 Now for the train ride, we may have an opportunity for a personal railcar ride for our crew down the canyon on the former Skunk car M-200, another of the spectacular and immaculate pieces of the Niles collection. Essentially it is done to the same standards as the #1423 pictured in this update. The canyon is green, and the wildflowers are out, with a rushing creek to complete the setting. A few words about the Niles Line. It was part of the true completion of the transcontinental railroad, bringing the railhead further west from Sacramento to tidewater in Oakland. There are two crossings of the creek down the canyon, one of the crossings still features the original cut stone pier visible in many early photos in the 1800's. The line was the only connection to the bay until the completion of the California Pacific along the shores of the north bay. Still most of the traffic came through Niles, as the CalP required ferry service for every car between Martinez and Carquinez. At the time, the Southern Pacific had the largest ferryboats in the world working that connection. With the building of the Carquinez railroad bridge, traffic on the Niles Canyon line dwindled. Early in the 1900's a competitor came to the canyon in the form of the Western Pacific. 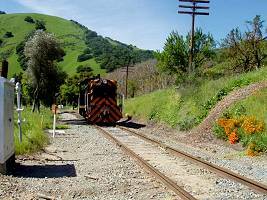 Eventually a trackage arrangement was worked out between the two railroads, and Southern Pacific's Niles Canyon line was slated for abandonment. Indeed the rail was pulled up, but the PLA and the county arranged to secure the line and relay rail on the ties that were left in place. It still has that 1930's charm, with telegraph poles along the right of way complete with glass insulators, and a two lane road with narrow subways in close proximity. Across the canyon in most places a now Union Pacific line humms with freight trains, and during the week up to 8 commuter trains a day. With the shocking development that we were able to take a ride on our "new car" last week, comes the realization that the time has come for the car. Countless people have told me the exact phrase "it was time for the car to move", and I couldn't agree more. In the electronics industry, the phrase is "it's time to shoot the engineers and ship the product". The somewhat grainy (capture from a video) shows that first ride. The weekend of 4/16-17 will be the first scheduled work days on the car. Going forward, the second weekend of the month will be normal workdays on the 330. 1) The car has performed beautifully and stayed straight after having all the false work removed. 2) The wheels nearly fit on the first try, and we're very close on coupler height. 3) Enthusiasm at Niles has far exceeded my expectations. 4) Expertise of Niles will allow me to leapfrog the learning curve regarding brake systems, wheels and couplers. 5) Our volunteer crew has been energized by the move. 6) I have been energized by the move! Air Brake system - #2, Niles/Wes tbd, New Airline, test 14" cyl, hang already H&H'ed air reservoir, find new triple valve (modify ABD? ), install hangers, install levers, fabricate linkage, modify tail, install front hand brake, hoses, plumb conductor's valves. Obviously Wes is a bottleneck. If you notice the Steps project, this has been delegated to Sid, who is an avid woodworker. The more things that can be peeled off from me and have an enthusiastic project leader, the more that can happen in parallel. Examples might be someone willing to work and learn from Dennis to become our airbrake and/or friction bearing ace. Someone might wish to take over the windows (all but 9 are already built, need trimming, glass and paint). Another mostly complete task is the drop steps, or hanging the air tank. Dave has volunteered to take the electrical on. Don't be afraid to tackle something you may feel is too much. As long as you keep quality first, no one will be pushing you, and we won't let you fail. Anytime you need help to get unstuck we're there. 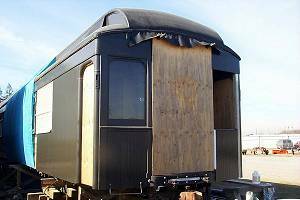 I've been in the same boat myself, and have gone to the experts on several occasions, just ask the Nevada State Rail Museum! After the great move, there is still work to be done. We had placed 60+ ties at the crossing for the truck to back up onto. If you look at the photo attached notice that the front end of the car is still on the dolly and extends about 20 feet past the edge of the crossing, resting on those ties. These ties had to be removed prior to the weekend operations of the railroad. I was able to get this accomplished in about 2 hours with help from a couple of new friends (by definition anyone who will help wrestle ties is a friend). Also we felt the car looked a bit shabby from accumulated gray dust from Morgan Hill, Dave Lion washed the mainline side of the 330, which greatly improved the general appearance. Finally Claudia went to work straightening the disheveled interior of the 330, which in all our haste prepping the move was messy even by my standards. All three tasks were done at the same time, and we completed it early enough to enjoy sitting on the observation deck and having a glass of wine and some cheese. We did have a few visitors by the car. Dexter was touring the car when he asked if the new owner of the car had been by yet. Sure enough, in the fine print there is a new owner.....Baldwin, one of two stray cats adopted by the railroad. Now Baldwin is a dead ringer for our cat Stubby, except without the big belly. Sure enough Baldwin made an appearance, bounded up the ladder and proceeded to make himself at home, sleeping in no less than 4 different places as we enjoyed the warm evening air. Train watching was also good with 3 ACE commuter trains and 2 freights just across the canyon. Note the 2 vintage wig wag crossing signals, even more rare because both have the original straight arms, not having been broken by tall Winnebagos or trucks. The large yellow beam in the middle of the trailer on the left is the turntable that allows the car to swivel during transport. The crane on the other side of the car is swiveling around to pick up the front end of the car. Cranes lift from a single point, so for lifting the car we need two points, one on each side of the car. With the tremendous forces at work lifting about 23,000 lbs on each end, any contact with the lifting cables would cause damage to the superstructure. The large metal bar below the triangle of cable is called a spreader, crane companies routinely supply these upon request for a lift. What they don't have is the matching piece underneath. Claudia and I scavenged around and located the metal, and Dan Perusina welded and fit it together. The suspending cables are actually nylon rope. This really surprised me, as I figured that anything lifting super weight would be of steel construction. As you can see, the crane had to reach across the car to lift the dolly after it was rolled out, but this was no problem due to the tremendous reach. 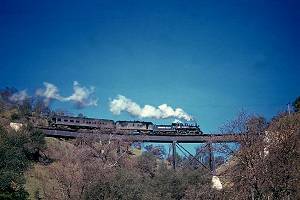 There is a group of dedicated Yosemite Valley Railroad historians that among other things have an eGroup and annual get together to visit the remains of the railroad. 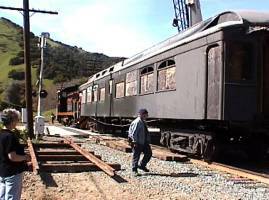 One such event a few years back was to visit the Brightside yard of the Niles Canyon Railroad for a tour of the YV107 baggage car. 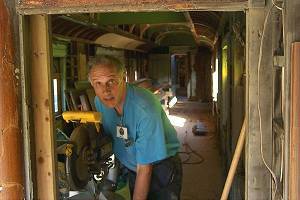 Alan Siegwarth took time to open the car and talk about the railroad's plans for it. He commented that it would be great some day to get the 107 and 330 together for a photo. As events transpired, today became that day. Before we get on with what is the best update we have ever had, a few thank you's are in order. A couple of weeks back, Rebecca Farly and her two hard-working kids Kathryn and Jacob put in a long day prepping the car for use as a workshop. In addition they made a donation to the effort. Now at the time it provided a much needed boost during a dark period when Roaring Camp was raining bad news on our project. The physical as well as financial help was one thing, but seeing a new generation of enthusiasts really fulfilled my vision of why we are doing the restoration. It wasn't that long ago I was a bright-eyed kid traveling through El Portal and seeing the YV caboose along the side of the road. Those memories have fueled my enthusiasm. Pat Cassell is another recent contributor to the project in several ways. Pat was instrumental in making the final connection that cemented the Niles location for our project. Gary Guttebo is one of Roaring Camp's managers, and was quite an advocate for us bringing the car there. He has contributed several days effort on the car, and took time out today to orchestrate the wheels move out of Felton. He also shares my keen regret the original plans fell through. We have a large cast of volunteers, Sid Gilbrech, Danny Perusina, Dan Perusina, Dave Baird, Larry Rossi, Tom Azevedo, Barbara Green and Ron Green, as well as several others, but I do have to give special mention to Dave Lion, who has been putting in some severe days prepping for the move. Niles Canyon has severely impressed me with the quantity and quality of their volunteer crews, today was no exception! I'll only mention one here, since I still don't have all the names straight. Dennis Mann was going to help with the move, as it turned out they had a full crackerjack crew that had the wheelsets already unloaded, greased and ready before I got there. I just can't say enough good things, especially since all I had to do was watch them slide the wheels under the car and position them perfectly. I would guess there were about 20 folks there from the museum helping out. Our moving and crane contractors Peninsula Crane, Murray Trailer and Bubba's Lowbed (cool name) provided excellent reliable service, a large component of why the move went off flawlessly. Finally I want to thank my painting and roofing crew, Claudia Swift. Not only is she the love of my life, but my best friend. Now on to the update. Today started at 4:30AM for me, 3:00 AM for the Murray folks. Claudia had the luxury of sleeping in until 6:00! Loading in Morgan Hill commenced about 6:50, and in Felton at 7:30. As expected the wheels at Felton were quicker to load, especially since Gary and I had pre-positioned the wheels and spiked the track together the night before. The wheels were in transit by 9:00. Meanwhile the Brightside unload site was spotting the beautiful NW2 tiger stripe SP switcher for moving our car and were ready to unload the wheels when they arrived about 10:30. The wheels were railed and pushed to either side of the crossing where we were to lift the car. By 11:00 the 330 departed Morgan Hill. The trip proceeded at about 45mph, not stopping until we reached the scales on the Sunol Grade. As part of the infinite government services available, a keen inspector noticed that the rear trailer license plate was damaged and took 20 minutes to write a fix it ticket. Hmmmm, 20 minutes at $450/hr. Thanks CHP for being so alert. The car arrived at Brightside during the noon hour, and the fun really began. We had to close highway 84 for about 10 minutes while the truck backed the 330 up onto the crossing. 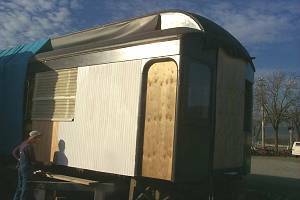 The trailer consists of two trailers, the rear one is chained to the 330, while the front long and separate trailer is a normal flatbed with a turntable mounted in the center, which in turn is mounted to the other end of the 330. Backing this rig is very complicated, and it took about 20 cuts to achieve the desired result, the 330 sitting as if it were on the tracks of the crossing. Next was the lift of the front portion of the load, which is actually the rear of the 330. once our new spreader bar was in place, the crane easily lifted it off the truck, which drove out from underneath. The wheels were rolled under the lifted end, and the car centered perfectly by the crane, and set down. The dolly trailer on the other end was done in much the same manner, except that with no brakes on the trailer we had to chain and drag it out from under the car. After the car was down on the other wheelset, attention turned to lifting the dolly trailer onto the flatbed so Murray could depart. The crane reached over the 330 and did that lift with relayed hand signals. Finally the couplers were lifted off a flatbed and one at a time reinstalled on the 330. To watch each 800 pound 6' long chunk of steel float 30' in the air was awe inspiring. Like I said, we're playing with the big toys! The day was quite warm, and everyone left with a sunburn. The hills are a vibrant green, and several clusters of bright orange poppies populate the scene. The switch engine with it's orange and black striping looks particularly good in this setting. What better ambience to enjoy our first ride on the car. Claudia and I hopped on board as well as the two nearest volunteers, Sid and Tom to enjoy the moment. The museum had spotted the companion 107 on the lead track, and we shoved almost up to a couple with it. The spot selected for the 330 is one of the best on the property, and I have to say, they are as excited to have the 330 as the car is to be there. There hasn't been a lot of spectacular stuff to update recently. I've been painting windows and trim at home, and while time consuming, it doesn't make for great pictures. But.... hanging the windows, well that's a different story! As you can see from the picture, there are 3 new windows in the rear first class compartment. While half the hardware for opening them is in place, I was unable to install the other half, as the ladder had disappeared from the car, and you need to be on the roof to install them. Since this will watertight this side of the roof, work will proceed to finish the ceiling area immediately. We have been fortunate to get two donations to further our cause to purchase the rest of the glass for the clerestory. My sister, Marilyn Swift, and Pat Cassell were the two donors, and it couldn't come at a better time. Needless to say, one of the miracles of this restoration has been our staying power during what future historians will call a Depression. I have toyed with the idea of outsourcing the restoration either to the Far East, India or Malaysia, until I realized that they make even more money than our crew. I know it's been a while for this update, I appreciate everyone's continued faith in the project. Trust me, there has been no letup in the prosecution of our goal. Our next update will feature 2 new stained glass windows in this same area. Haven't heard from me in a while? As the picture shows, I've been busy knocking windows together. I had a bunch of stock run to the window profile, and then cut them and fitted them. The first day of this effort included a work day with Sid and Jeff, and we setup much of the fixturing and put a sample clerestory window together, as well as cutting the entire stock to rough size. As luck would have it, we came in a bit short on the stock, so their will have to be a small second run. We've also been fortunate to receive donations from Patrick Cassel and Jeff Pennington, which goes above and beyond the call of duty in this economy. I'd also like to thank Patrick and any other armed forces personnel getting this list for their efforts that keep our country free to pursue happiness, which in my case is the 330. I've been extremely proud of the professional and humane way that our forces have conducted themselves. The picture below has nothing to do with the tongue and groove which was completed on the car on Saturday. 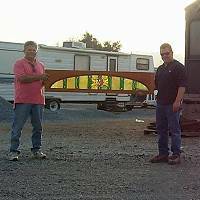 Two relatively new volunteers pictured, Sid Gilbrech on the left and Jeff Pennington right, are holding a window frame with the arched stained glass window inserted. The window was inserted into it's rightful place shortly after the photo was taken in the obvious vacant location. The glass is catching the last rays of the day illuminating the eye-catching design. Earlier in the day we had milled and installed the last of the missing filler blocks on the opposite side of the car bringing to a close the gratifying task of siding the car. This brings John Q Public's image of the car much closer to what has been mine all along. Case in point: a van sped by on the street and the driver shouted out his window "Nice job! ", definitely a new trend. We do get friendly toots from passing engineers on trains, and even an occasional thumbs up from them. Sid was kind enough to bring his T&G nailgun, which greatly expedited the task of blind nailing off the last 50 or so boards. I regret that I didn't know he had the nailer sooner! Claudia showed up later in the afternoon to finish priming the new wood. The latest updates have shown the spectacular progress on the left side of the car. No shown was the right side of the car, still naked to the weather down 2/3rds of it's length. With winter fast approaching we are concentrating efforts on that side of the car, and to good effect. Saturday Oct 12 found us with Jeff Pennington, Jack Burgess, Claudia and myself as the volunteer crew. I suspect that all concerned didn't have any problems getting to sleep Saturday night, as we slammed blocking all day into the right side in preparation for the T&G. Where the large "W" truss has joints, backer blocks needed to be screwed in, and filler blocks added between all the studs and cross blocking. Jack distinguished himself as the perfect block man: each piece needed to be custom fit - literally so they have to be pounded into place. The idea is that you glue the T&G directly onto a solid wall, in a way turning the length of the wall into one large piece of plywood. While this was going on Jeff was routing out backer blocks and screwing them and any other missing screws in the wall. In the meantime, Claudia and I were sitting in easy chairs offering advice while sipping our iced tea. Claudia and I returned on Sunday, and the picture shows newly primed white T&G over part of the prepared area. New blocking and a portion of the "W" truss is visible just beyond. T&G now extends all the way across the new blocking, as Claudia and I put in another day on the car yesterday. I If you've ever walked through a passenger train, when you pass between cars you walk through a tunnel like contraption that keeps the weather out and the people in. In railroad lexicon this is referred to as a diaphragm. The very front where the two cars meet has a striker plate, and that is what you're looking at. When we first acquired the 330, the plate was gone, but the bottom (upright in the photo) was intact. The bottom piece alone weighs in over 100 lbs, once again proving that nothing on a railroad is subtle. We managed to secure the large "U" shaped striker plate, but of course alterations had to be made, including putting 10 new 1/2" countersunk rivets in to mate up the two pieces, as well as repairing the two universal sockets that were in several pieces (seen perfectly restored at the lower end of the photo. The piece which weighs in at over 500 lbs, is attached to the car on spring loaded arms, and a set of baffles now needs to be built to complete the accordion appearance of the tunnel. 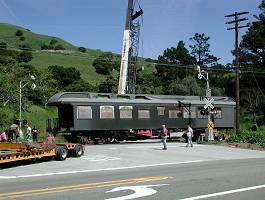 Seven years ago today, August 24th, 2002, the 330 rolled out of Yreka on a 55 foot flatbed trailer. 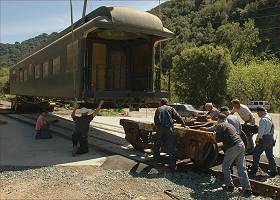 The move was timed to coincide with the 50 year anniversary of the last run of the Yosemite Valley Railroad, making this the 57th anniversary of that melancholy event. At the time, I had confidently predicted 6 years to completion. I still think that time frame was doable, if I was to have no other life, or possibly rich parents to bankroll the effort. The good news is that we've reached another significant milestone on the project, as the picture shows. The two girls in the picture are my sister Marilyn, and my wife Claudia, and represent the crew that slapped up the siding starting from the small center window down to the observation deck in a long two day burnout session. What a crew it was. 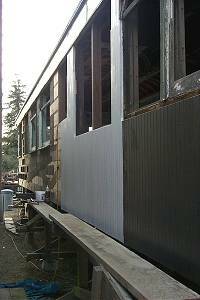 About 300 pieces of siding go into each side, so figure we hung about 150 boards. Each piece was cut exactly to length, glued on the back side with PL (expanding type glue), then fit into place, predrilled and blind nailed with and average of about 8 galvanized finish nails. The long boards that fit under the letterboards were caulked on top. Needless to say, this completion is the single most gratifying work to be completed to date. We are now going to concentrate on getting the car watertight for the winter, as well as setting up a workshop inside once that's done. Can I predict when the car will be completed? Probably not. But I do know that we intend to have the car available for events in 2006. When I reflect on the start of the project, and the many serious obstacles we've already overcome, well I think we're on the downhill side of the project. I look forward to rainy days working in the comfort of the car and sipping coffee while trimming out the interior. Most of all I look forward to sipping some good wine while on the observation deck during the maiden run. The last 2 months have been somewhat busy, and time at the railroad car has been at a premium. Despite the handicap of having a "real" job, we've managed to get a few productive days in, and the progress is telling. First, kudos to Mike Linxwiler and Christian Ollson, who spent a day helping with the undisclosed big project to be featured in an upcoming update. 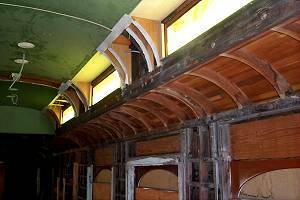 Also doing tremendous work has been Burnett & Sons Mill in Sacramento, who have turned out a full set of the Mahogany curved window frames, one of which can be seen installed above the first window. While the frame seems small, it actually measure five and a half feet long. One of the new members of the list is Tony Davi, who was kind enough to somehow squeeze 16 frames and 32 portals into his car and deliver them from Sacramento, thereby saving me 6 hours on the road to do the same. Finally I'd like to compliment Claudia my wife, who has not only stood by me on this project, but has really kicked in the afterburners. 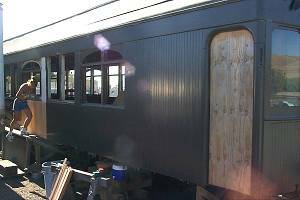 She and I were able to install two window frames (the second can be seen silhouetted through the front window) and 37 sticks of siding as well as priming the siding. Claudia also took this sunset study of the restoration effort. Note the other front window has been installed, as well as the grabiron underneath. As you can see we have been busy slapping siding on the car. Both sides are to the end of the first set of double window on the front. We have to halt there until I make a pattern for milling the stained glass arch(done in mahogany) above the windows, as the arch interlocks with the siding. I'll indulge and send another shot tomorrow with the final green paint. You can see that a glistening beauty is emerging from the collage of beams, blocks and false work. Clem...I mean Claudia, is applying primer to the T&G. Claudia has blown away Mike Linxwiler as our most prolific worker, I can't tell you how many times I've dragged her the 50 miles over the hill to help out on the project, in fact virtually all the pain work on the car has been at her hand. Other work that has been progressing on the left side of the car: all the internal knee braces are installed , the nailing strips as well as 60% of the missing backer blocks. Note the extra flap of roofing material hanging down from the center roof to the lower roof. We are leaving this in place until we install the upper clerestory windows this summer. Donations would hasten this aspect of the project.